After spending 99% of my time computing time on Windows operating systems (predominately XP) I recently decided to give Linux a go. I had heard mixed reviews of this free operating system but most people seemed to enjoy using it. My initial response was quite good but I quickly got annoyed with a few things; this included not being able to install a lot of programs and games that I regularly used on Windows. As I type this I am back on XP because I honesty got sick of using Linux. Incompatibility with lots of Windows programs was the main reason I disliked it. The simplest programs like WinRar, iTunes and Microsoft Office were unavailable and this slowed down my productivity on the computer. The word processor and accessory package Open Office came pre-installed with Kubuntu. This got the job done for simple activities but was quite annoying when it couldn’t open .docx files from the latest version of Microsoft Office. The initial installation of Kubuntu was smoother than the windows one. First it lets you boot off the CD so you can play around and decide whether you want to fully install it. After you choose to install it (from a link on the desktop) it will automatically set everything up and prompt you to enter an admin password, this is needed when you install programs etc. Then it will reboot and you can start using Kubuntu straight away. Another thing that was a little better than Windows, was the sound driver and internet connection. Usually I have to look around for several CDs and drivers before I can get these things working but with Kubuntu, everything worked automatically. The fact that Linux is free might be a reason for you to want to use it, however in my experience I would much rather pay for Windows and have the freedom to install any games and programs I want. Only a small percentage of computer users use Linux. This may be a reason for why it doesn’t get viruses at the present. Because of this, users don’t have to worry about buying anti virus software and all the other rubbish that is needed. Your computer will also be faster because Linux uses less computer resources, and not having to always have an anti virus program running would also help speed it up. This has been quite a negative review, however I only tried it for a short amount of time. I have seen quite a lot of cool looking visualizations on sites like YouTube but never got around to installing any of these. I am sure with enough modifications and some decent knowledge, it could become quite a decent operating system. Grand Theft Auto IV For PC? Update: GTA IV will be released for PC on 21 november for everyone except the US which has been delayed to December 02 2008. Will Grand Theft Auto IV be released for PC? Every other game in the series has been, so are Rock Star obligated to? People world wide are intrigued to know if GTA4 will be released to PC users. Since GTA1 the game was made for PC. GTA2, GTA3, GTA Vice city and GTA San Andreas soon followed and were released on PC. However, what have Rock star done in the last 3 years? The Stories series were never released on PC, and were PSP first grabs. Not to mention cutting The Stories series short by 1. Rock Star released GTA4 on the Xbox 360 and PS3 platforms on Tuesday 29th of April and currently only talk of GTA4 being released on PC. No real facts from Rock star themselves has had PC gamers a little worried. Though there seems to be light at the end of the tunnel. Looks like grand theft auto 4 for pc could be released as early as November the 30th 2008. So don’t rush out and buy a Console, stay strong and Wait this one out. 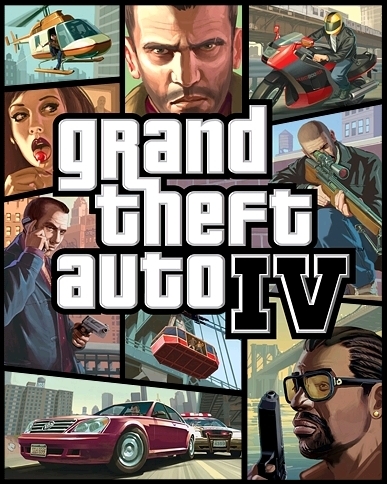 GTA IV has similar aspects to previous games in the series. The game play consists of elements of a third- person shooter and a driving game, giving the player a large, open environment in which to move around. On foot, the player’s character is capable of walking, running, swimming, climbing and jumping, as well as utilising weapons and basic hand to hand combat. 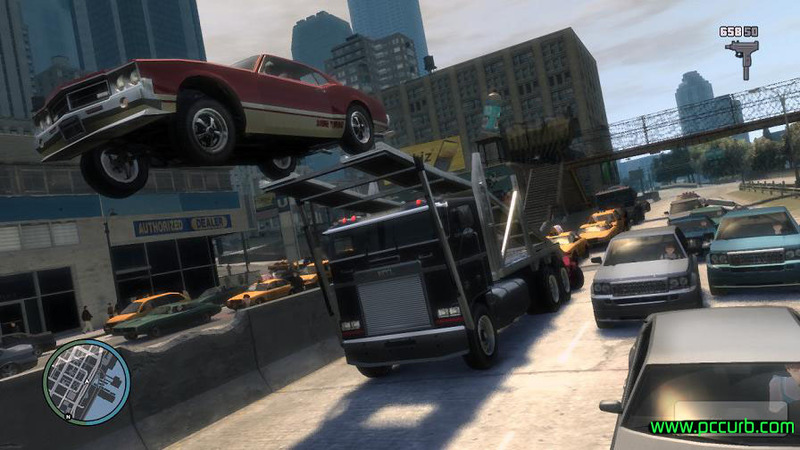 Players can steal and drive a variety of vehicles, including automobiles, boats, helicopters, motorcycles and many more. The game is set in a new and improved version of liberty city, “wow, that is a change…” and is said to be smaller than the actual size of San Andreas, but the biggest single city to be presented in the series. Game makers state that to start from one side of the city and cross to the other will take you over one hour to achieve. The game also features actual landmarks that are found in New York city where the game is set. 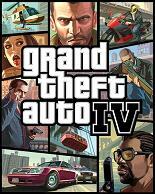 Hopefully GTA IV for PC will be released in the near future. 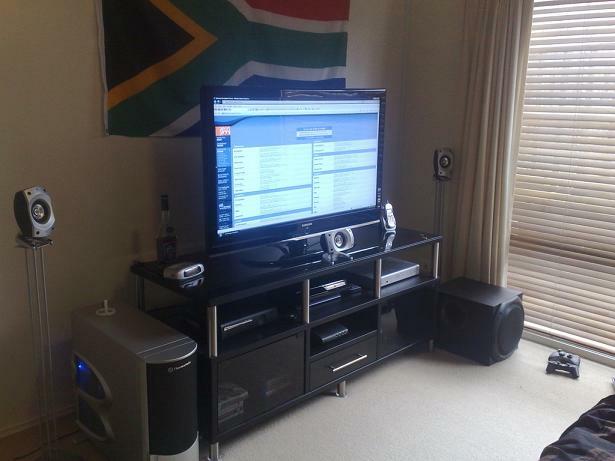 This is a monster setup, and is probably the best setup posted so far purely because of the size of the massive screen. Who needs three monitors when you have a screen this big? A setup like this has many advantages like being able to use it as a TV. 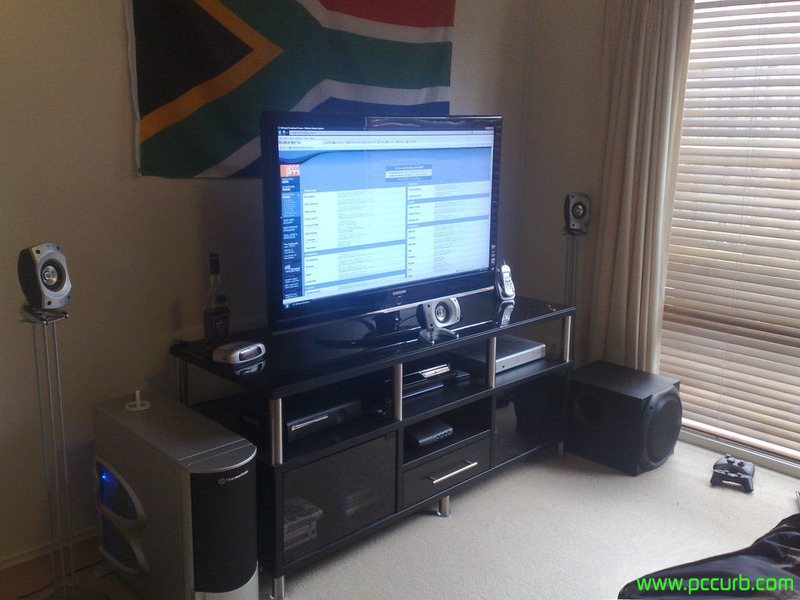 Plus the sound system that is setup would mean it could be used for mutiple purposes; like gaming, listening to music or watching movies. Even though this is more like an entertainment setup then PC, I’d still rather it any day. 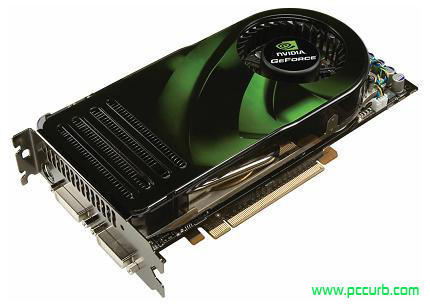 Many people have heard about the new Nvidia 9900 series cards that are said to be released sometime during July, and have decided to hold onto their cash until then. Personally, if i was in the market for a new card, i would seriously think about waiting until this one comes out. It is scheduled to be released in July, priced at $500+, along with ATI’s new 4000 series. Try out Americas Army, a free multiplayer first person shooter! With over 9 million registered players some of you are bound to have heard of Americas Army. It really is a good game that you can spend hours and hours playing. It may not be so tempting when the file size is 2gb but it is worth it in the end. Game play is entirely online. You will play against real people around the world in a variety of maps. The only thing that is offline is the basic training, but you are still required to be connected to the internet to be able to save your results. 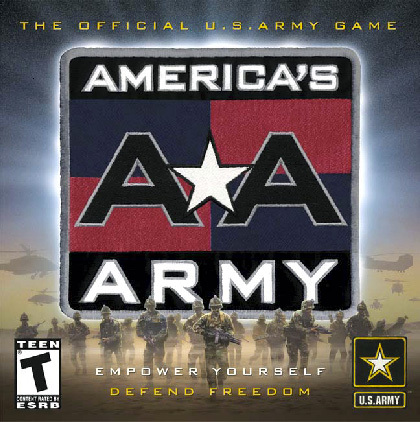 Americas Army is a project and funded by the Army Game Project, which means the game and training within the game is as real life as possible. You are to complete basic training before you are allowed to play online, this could take a few hours for a new player depending on if they do medic training or the special forces missions aswell which are not mandatory. Currently in the 2.8.- series, Americas Army will be releasing 3.0 late 2008/early 2009. The game will be entirely different and built from the bottom up. Head over to: http://americasarmy.com to make your free account, then navigate to downloads to get started. Hooah! If you have a close look at the screen in this photo you will notice it is actually the same one that is used in the header for PC Curb. 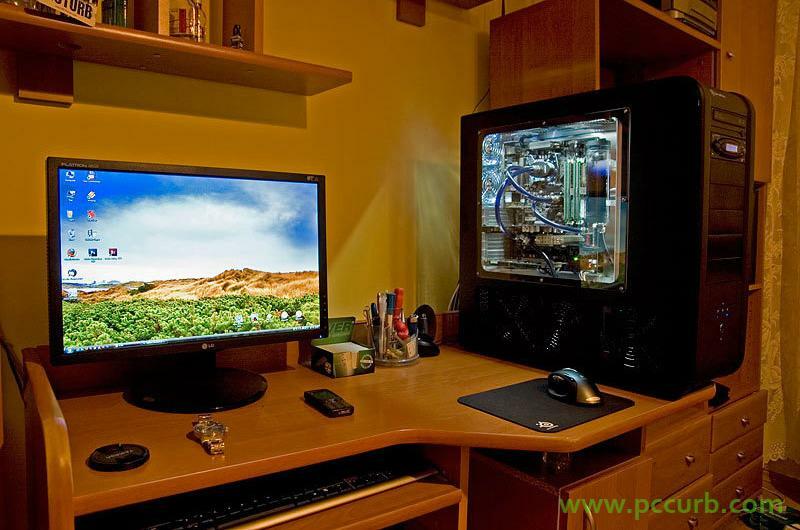 As for the setup, it is quite clean and I really like the side window on the case. The Pirate Bay launches new, free blog hosting service. It’s called Baywords. Baywords is a free wordpress blog hosting service provided by The Pirate Bay to protect freedom of speech. They claim you can post whatever content you like as long as it complies with Swedish law. Once you sign up you will be provided with your own subdomain (yoursite.baywords.com) and TPB will enforce minimal advertisements. By now a large majority of internet users have veered away from using Internet Explorer because it is simply a crap browser. Firefox (the better alternative) has released a beta of it’s new browser. Even though it’s still in Beta (not a final release), most users say it still provides a smooth surfing experience,while still protecting your computer from viruses, spyware and pop-ups. The new version features: easier navigation for everyone, better speed to execute regular expressions and users may navigate with keystrokes rather than mouse clicks.